Simplified principles and design patterns of the skeleton and muscle alternatives. Most androids presented during demonstrations have a pitiful gait, the locomotor system is reduced to some actuators. Even the Toyota robot that runs 7 km/h keeps legs bent and has minimalist movements. We could hardly image them dancing twist. The Asimo robot has a similar gait. We should therefore multiply the actuators if we want to get closer to the human gait. The first diagram shows the "skeleton": an architectural support for actuators that will make the robot walk. This skeleton has stops to allow the robot to remain stationary without using power to maintain the upright position. It is assumed that the actuators tend to recover their original position after action, as do the muscles, therefore we have to add a clamp joint to maintain any position in addition to stops that are used to keep standing. On the hip, two movable stops which retract during walking. This system can optionally be replaced by a clamping device as to the knees. 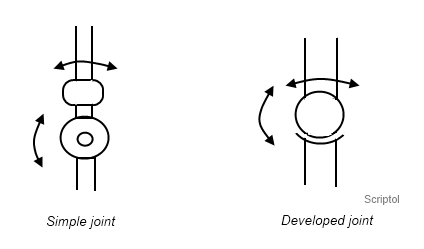 The knee joint can be performed in a simplified way with a pivot. It can be tightened to hold the position. Since the leg bends only on the back side, we place two stops to lock it on the front side. 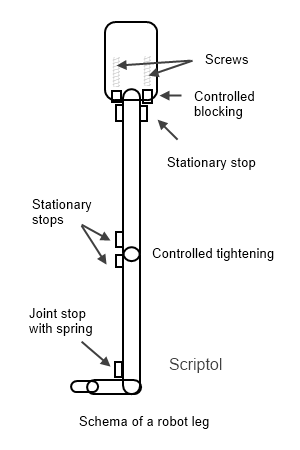 The ankle joint is made as a pivot but with a removable stop, course is slowed by a spring. The foot must only bend to a certain extent. We previously saw how to design actuators. To automatically return to the initial position when removing the stimulation, in this case an electric current, we can add a spring. Can be designed in two ways: the simplest would be to have two pivots oriented in opposite directions. Their combination allows all movements but it is more emcombrant. It can also perform as a ball attached to a section and which can move in all directions in a cavity. This is closer to the human model. But in this case we must control the movements with more actuators, connect the two parts with clips and add a lubrication system ... We can give to the cavity a shape such that the movement is ample in a direction and stuck in the opposite direction. Then remain to attach the actuators like muscles on the skeleton with ligaments. This is something that will be developed experimentally in order to obtain more realistic movements.